Despite the sudden and spectacular availability of tiny small-displacement bikes to ride, manufacturers are still participating in the displacement wars. BMW is no exception; even though they have already stuffed a 1600cc inline six-cylinder engine into a sport tourer, the boxer engines might be due for a very big upgrade. No, I’m not talking about the 1250cc R-bikes here, but an 1800cc boxer twin engine. Yeah, you read that right: 900cc per side is a big freakin boxer. But we have pictures, and though it showed up in Yokohama at the Hot Rod Custom Show in 2018 (along with that R7-esque Roland Sands design) nobody could quite believe it. It’s rearing its head(s) again at Revival Cycles, a custom motorcycle outfit in Austin, TX. 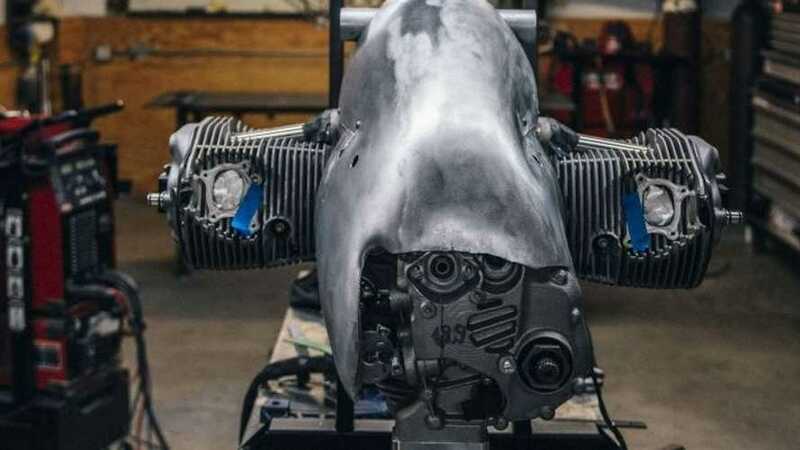 They’re stuffing this enormous opposed twin engine into an intricately hand-built frame they’ve dubbed a “birdcage.” There are loads of fantastic pictures on their website but maddeningly little actual information about the motor. The saying that a picture is worth a thousand words is not the case here, and we have so many questions. Like: for such a new/interesting engine why have they built a big blobby metal cover for it? Where did they get the engine? Will it have any kind of rear suspension on it or are we counting on the “birdcage” to flex a bit? One question, I can guess the answer to pretty easily: Why these guys and not any other custom shop? Probably because they host the extremely popular “Handbuilt Motorcycle Show” every year in Austin, where custom builders bring their creations in from all over the country to display their hand-built custom motorcycles. No doubt the end product 1800cc boxer twin “Birdcage” custom bike will be displayed at the 2019 Handbuilt Motorcycle Show. We are going to be haunting the Revival Cycles website for more information and more pictures. And hopefully some answers to all the questions. It is obvious from their website that Revival Cycles lives by their description: a “cultural center for motorcyclists.” They value aesthetics as much as functionality, and they are old school, favoring an english wheel and a hammer, fabbing things out of foam before creating them out of metal. Yes, they use a CNC machine but there is so much hand-fitting going on. Their designs aren’t just outside the box; you can’t even see the box from where they’re standing.